Very quiet and isolated from other populated areas, but only 15 miles from Los Cruses. Vehicle decal no longer required for entering the post, only a current military ID (active duty or retired). The commissary and exchange are more than enough for provisions, but no diesel or propane available on the post (purchased an electric space heater to save on propane-was a great investment). Very little traffic on the post, especially during "rush-hour." Excellent (intermediary level) hiking trail behind the golf course, going up Texas Canyon (which enters the Organ Mountain Range) ... the trail ends at Texas Canyon Spring (can view with Google Maps satellite view). Only mountain climb if very experienced, but worth it. Outdoor recreation staff is friendly/hospitable. 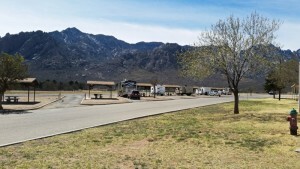 No laundry facility at the campsite - a Launderette is located close to the bowling alley. Well worth returning next year.